Hotstar is an online video streaming platform owned by a subsidiary of Star India Private Limited. 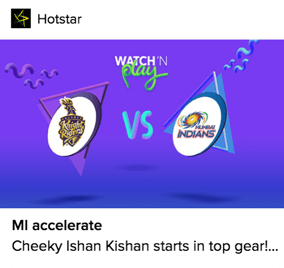 Hotstar is India’s largest premium streaming platform, with more than 100,000 hours of video content available in 17 languages, plus live coverage of major global sporting events. Launched in early 2015, Hotstar is one of India’s most downloaded apps, with more than 350 million users. With advanced video streaming technology and attention to a high-quality, cross-platform user experience, Hotstar also gives advertisers the optimal platform for reaching their target audience. Hotstar is the most-downloaded OTT app in India, with 137 million downloads in Q1 2017 alone. Using data-based insights from Pivots, Hotstar optimizes send times to increase engagement. With event-centric campaigns, Hotstar is able to increase engagement and the average watch time per session. Big ticket sports events are the biggest acquisition drivers for Hotstar. But to be successful, Hotstar needed to retain these users beyond the sports season. For any OTT player, monetization is key. Hotstar’s revenue comes from two models — AVOD (or Advertisement Video on Demand) which comprises of free users, and SVOD (or Subscription Video on Demand) which comprises of paying subscribers. As Hotstar scaled, moving people across the funnel from freemium viewers to paid subscribers became increasingly important. In order to scale successfully, Hotstar wanted to personalize the entire user experience — not only on platform, but also off platform. With over 300 million user profiles to segment and analyze, this was a major challenge for Hotstar’s product, marketing, and data science teams. CleverTap’s data-driven mobile marketing suite plays a crucial role in Hotstar’s growth. During IPL, the world’s largest cricketing event, Hotstar achieved world record of 10.3 million concurrent users for a live event. CleverTap’s push notifications supported Hotstar’s tech stack to deliver 100 Million+ messages in a couple of minutes. 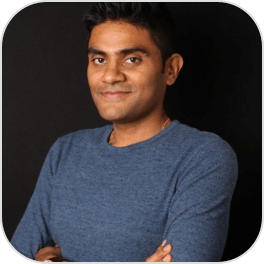 Using Flows, Hotstar is able to not only find friction points, but also identify the best spots in a user’s journey to engage with them and increase conversions. Hotstar also localizes notification campaigns for free users. These localized campaigns tailor content recommendations for users in their native language, and helps Hotstar achieve higher engagement. CleverTap’s RFM (Recency, Frequency, Monetary) Analysis provides Hotstar with automated segmentation capabilities. Based on a user’s purchase history, location, and engagement frequency, Hotstar can track app usage, predict churn, and create relevant engagement campaigns. Hotstar uses Pivots to pinpoint which days and times of the week certain user segments are most active. Hotstar is able to segment users in real time based on the actions or inactions they undertake within the app, and send customized push notifications. By tracking user cohorts, Hotstar can identify users on their browsing and viewing history, consumption patterns, preferred genres, etc. on a daily, weekly, and monthly basis. With content in eight languages spanning 15 channels, Hotstar is home to some of the highest-rated TV shows in India. Hotstar’s aim is to become the #1 video streaming app worldwide. Machine learning plays an important position in Hotstar’s roadmap, with the team aiming to make the user experience highly personalized — benefiting not just consumers, but also advertisers and content producers.